Deep purple-red beets are used to transform classic fresh egg pasta into an eye-catching but simple main course. The root vegetable is boiled and puréed before it's mixed into the dough. The result is a neutral-flavored pasta that pairs well with a wide range of different sauces and fillings. Note:For more pronounced flavor with the same vibrant color, douse the raw beets in olive oil, salt, and pepper. Wrap them with rosemary or thyme in foil, and then roast them in the oven at 375°F until tender (about one hour). You can also add a small amount of lemon juice or zest, spices, garlic, or even cheese to the dough for more layered flavors. Using a higher ratio of egg yolks to egg whites ensures delicate, rich noodles with a classic Italian flavor and texture. Kneading by hand allows for optimal control over the quality of the dough. Adding salt to the dough provides a more balanced flavor. Bring a large pot of water to a boil. Add rinsed and trimmed beets and cook until easily pierced with a fork, approximately 40-45 minutes. Drain and let cool. Peel beets and purée with a hand-blender or food processor until smooth. To Make the Dough: On a large, clean work surface, pour flour in a mound. Make a well in the center about 4 inches wide. Pour whole egg, egg yolks, beet purée, and salt into well and, using a fork, beat thoroughly. When combined, gradually incorporate flour into the eggs until a wet, sticky dough has formed. Using a bench knife, scrape excess dough from fork and fingers. Begin to fold additional flour into the dough with the bench knife, turning the dough roughly 45 degrees each time, until dough feels firm and dry, and can form a craggy-looking ball, 2 to 5 minutes. Press the heel of your hand into the ball of dough, pushing forward and down. Rotate the ball 45 degrees and repeat. Continue until dough develops a smooth, elastic texture similar to a firm ball of Play-Doh. If dough feels too wet, add flour in 1 teaspoon increments. If dough feels too dry, add water slowly using a spray bottle. Wrap ball of dough tightly in plastic wrap and rest on countertop for 30 minutes. To Roll the Pasta: Meanwhile, place a sheet of parchment paper on a tray or cutting board and dust lightly with flour. Unwrap rested dough and cut into quarters. Set one quarter on work surface and re-wrap remaining dough. 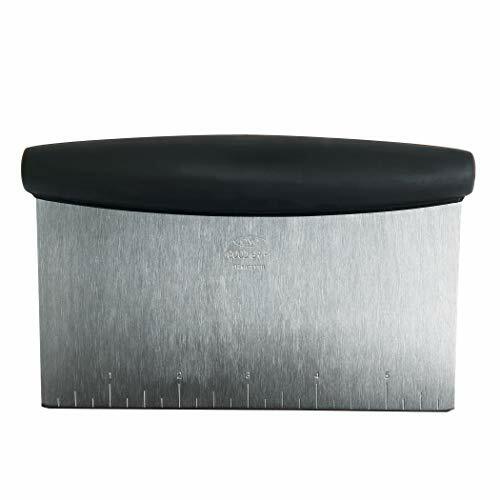 With a rolling pin, flatten the quarter of dough into an oblong shape about 1/2 inch thick. 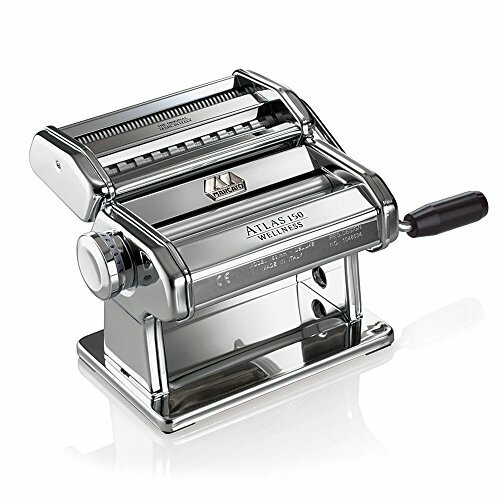 Set pasta maker to widest setting and pass dough 3 times through the machine at this setting. Narrow the setting by 1 notch and repeat Step 8. Repeat once more (the dough should now have passed through the third widest setting). Continue passing the dough through the rollers, reducing the thickness by 1 setting each time until it reaches the desired thickness. It should now be very delicate and elastic to the touch, and slightly translucent. Cover dough with plastic wrap or a kitchen towel to prevent drying, then repeat Steps 6 through 10 with remaining dough quarters. If making noodles, cut dough into 12- to 14-inch segments. To Cut Noodles: Adjust pasta machine to noodle setting of your choice. Working one dough segment at a time, feed dough through the pasta-cutter. Alternatively, cut folded dough by hand with a chef's knife to desired noodle width. Divide the cut noodles into individual portions, dust lightly with flour, and curl into a nest. Place on parchment-lined rimmed baking sheet and gently cover with kitchen towel until ready to cook. Pasta can be frozen directly on the baking sheet, transferred to a zipper-lock freezer bag, and stored in the freezer for up to three weeks before cooking. Cook frozen pasta directly from the freezer. To Cook: Bring a large pot of salted water to a rolling boil. Add pasta, stir gently with a wooden spoon, chopsticks, or a cooking fork, and cook, tasting at regular intervals until noodles are just set with a definite bite, about 1 1/2 to 2 minutes. Drain, toss with sauce, and serve.